Using a mixing bowl, whisk the eggs and add the parsley, salt, pepper, garlic and onions. Remove the edges of the bread and cut it into small pieces. Soak the bread pieces in a bowl of milk. Transfer the milk and soaked bread into the mixing bowl with the rest of the ingredients. Add the ground meat to the mixing bowl. Blend and mix all of the ingredients using your hands. Roll the meatball pieces using the palm of your hands. 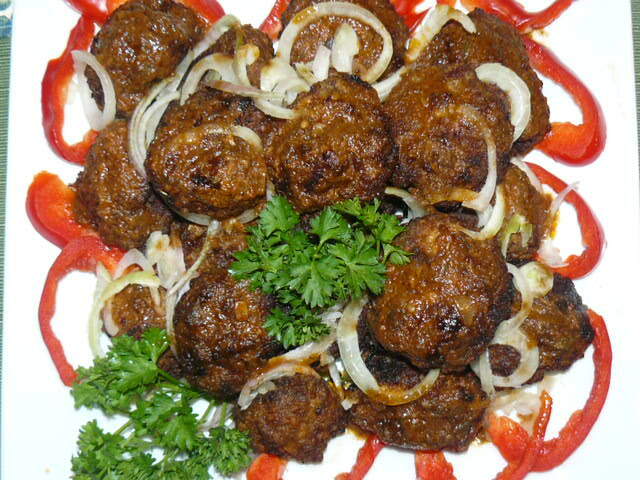 In a skillet, heat oil and brown the meatballs evenly over medium-high heat. Remove from heat. Enjoy.